These blankets are designed to coordinate with the Simple Lines Baby Hats. They are simple with just a bit of elegant detail in several sizes. Repeat rows 5 through 12 until blanket is desired length ending with a row 10. Then work rows 1 through 4, cast off, finish off, secure and weave in end. Repeat rows 5 through 8 until blanket is desired length. Then work rows 1 through 4, cast off, finish off, secure and weave in end. 1/22/2014 – changes to clarify portions to be repeated across the row. these look beautiful cant wait to try, thanks! I agree with you. the patterns are just gorgeous. Can’t wait to make them!!! Gosh I just love these! Right up my alley simple..Thanks so much for sharing! Thank you for great patterns. Presentation is wonderful. Love these! One question…do you use one or two strands of yarn? One for the gauge and measurements given. They can certainly be made with two if you like. Repeat just the p1, k5 in the parentheses across the row. when you see anything with (p1,k5) two times; means pearl 1 knit 5 and repeat it two times. Purl is the correct spelling. Thank you so much for sharing the patterns to these beautiful baby blankets!!! Yarn suggestions for a baby boy? I’m hoping some others with more fiber knowledge will jump in here with some ideas. The artificial fibers are better than they were years ago and wash well, keep their color and some are very soft. There are some great cottons for babies now, and organic cottons. The new bamboo blends are really nice, and bamboo tends to be stain resistent. I spent some extra $ on a set of bamboo circular needles 36″. There weren’t any aluminum that long. I LOVE the bamboo so worth the extra money, even for a beginner like me. They don’t slip like the others. LOVE LOVE LOVE em”. I also love the bamboo needles. I am currently working with older needles and it is very frustrating compared to the bamboo. Bamboo yarns will feel “cooler” to the touch, so they’re good for light blankets and garments for warmer weather. I did a baby cocoon in Premier Angel yarn, and it’s nice and soft. The two plies tend to split apart so you have to keep an eye on it, but it’s really nice for baby projects and it comes in blue. Oh, yes, bamboo NEEDLES (she said needles, not yarn) are SO great. They are well worth the money. I was surprised how much easier they were to work. 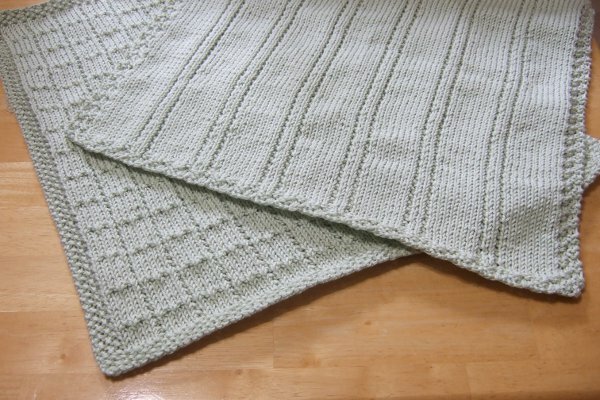 I use Cascade Cherub Aran yarns for my baby blankets. I’ve made 3 of them with this yarn. It’s very soft and is easy to use. It washes beautifully and is even softer after washing. I also used an Aran blend and knit the smallest size with a tiny seed stitch hat. I am sending both to “Lily Love the language of yarn” A woman who helps refugees with hand made blankets etc. Really worth the effort to wip up one of these blankets and a small premie hat and send it to her. She and some woman in Turkey sew eight inch knitted squares together and give them to Syrian refugees. All types of knitted things are welcome. As thanks for your effort she posts a picture of your work on Facebook. I used “I Love This Cotton” from Hobby Lobby on both of these blankets. Very inexpensive, plus it looks and feels absolutely wonderful. Plymouth Yarn Company’s “DK Merino Superwash” is a perfect yarn to use. The color “Cornflower” is a really pretty light blue. The yarn is machine washable and machine dryable. It is nice to knit with, too. these blankets are beautiful, I am looking forward to trying them. Thanks so much. I am certainly happy that it is a easy pattern as well. Thanks again. I just love the design of these baby blankets. I knit baby afghans all the time and will use these two patterns. Using worsted weight yarn and size 8 (5mm) needles, use the Large versions of the blankets to get a 36″ width. Great idea making these in worsted! if you use worsted weight yarn, how much yarn do you need to make the 36″ wide afghan? Use size 8 needles and cast on for the Large size. It will take about 1000 yards. I love the baby blanket designs and the fact that they come in different sizes. I have a question about the sizes though. A relative works in labor and delivery at a local hospital and the nurses would like very small (12 x12 or a bit larger to put in the rememberance boxes for parents who have lost a child before it was viable. I could use dishcloth patterns, but think using baby blanket designs with ‘baby yarn’ would be a lot more thoughtful. My problem is that I don’t know how to decrease a pattern if I need to make is smaller and there aren’t directions given about how many stitches are needed to make a row. I would appreciate any help with this so I can donate a part of my heart to the parents of deceased babies. Thank you so much for making these precious blankets. I have been making 15″ square blankets for my local hospice for the same purpose. These blankets are a multiple of 12 plus 6 or 7 respectively. Using the extra small size and subtracting 12 stitches will make a 13.75″ blanket. Subtracting 24 stitches will make a 11.5″ blanket. About 3 oz/160 yds. Size 6 (4mm). But how long does the needle have to be? And do circular needles keep tension? And that is a point that they make the needles varying lengths and the nylon varying lengths. I like the nylon to be long enough that my stitches aren’t bunched up so tightly like they would be on straight needles. The needle length of my circulars are several inches so I’ve not had any tension problems. I would imagine that circulars with really short needles would pose tension problems. I love these designs. I knit scarves for the homeless here in Tulsa, Ok. Sometimes I take different patterns and adjust them for scarves. i also do baby items to be given out to the homeless during the holidays. Thanks. Would DK weight yarn be appropriate for these blankets? Or weight #3? The measurements and yarn requirements given here are for DK/#3 yarn, but these could be made in other weights as well. I have Babyboo yarn #5 weight 50 grams How may do I need to do these afghans ?????? And a 5 needle ? I don’t think the difference in the needle size will make a material difference with the gauge. That yarn has 112 yards per ball, so depending on what size you are making, that will help you determine how many balls of it you need. I love these blankets and can’t wat to start vertical stripe. The squares pattern is from an old Columbia Minerva book which I bought from a lady in knitting paradise because of the squares. I am making it in yellow. All blankets for charity and I love this site. Thanks very nuch! The stitches in the parentheses (p1, k2, p1, k8) are to be repeated across the row to the last 5 stitches. Oh My Goodness, these blankets are just gorgeous!!!! I can’t wait to try them!!!! Thank you for great detail in the directions. These blankets are lovely – cannot wait to try them out and give as gifts. Thanks for sharing the pattern. Recently dropped off 3 baby blankets I had knitted recently. The ladies were very happy. They said they get alot of other baby items, but not very many blankets. I think the blankets are easier to do. Thank you so much for these patterns. They are so simple and elegant. I just found out that my neighbor’s daughter is pregnant. I went out tonight and purchased yarn for both blankets. Can’t wait to get started! I want to start this proyect as soon as possible, I love the idea that they have different sizes. I have two babies to give to. Thanks! Can’t wait to knit these! I have stash that I’ve been wondering what to do with. No new babies coming that I know of but there will be gifts when some do come along!!!!! Thank you. I am not sure what DK weight is. I see numbers 1-5 used on the labels. Cant wait to knit these and to share the patterns with one of our ladies at knitting group as she loves knitting blankets. beautiful! looks like something i will definitely try. thanks so much!!!!!! I would recommend Baby Soft from Lion Brand Yarn. If you want to use worsred weight yarn then I recommend Pound of Love from the same company. Happy Knitting! Do either of these yarns pill when washed? My experience with those is that they don’t pill. Thank you for letting me know. By chance do you know if Caron Softee Baby or Caron Pound pill? Maybe a tad from the Softee Baby but not bad. Pound holds up pretty well. I love Caron Simply Soft but I think it pills the most of the Caron products I’ve used. I am sorry I meant Softee Baby is by Bernat. Is that the one you said was good to knit with? I do appreciate your help with this. I want to do a baby blanket and need to use acrylic since I am allergic to wool. I am trying to find something that won’t pill. That’s right. Softee is by Bernat. I’ve had really good experience with it and it washes and lasts well. This is easy and looks so beautiful. I am going to be a Grandma of twins. Thank you so much for sharing. What is the repeat for the vertical blanket? I’ll be using Lorna’s Laces Shepherd Bulky and was told to use a CO of 126 for a width of 36 inches. I’m trying to figure out what the repeat is but striking out. I think my brain went numb. Thanks. The vertical is a repeat of 12 plus 6, so 126 would work. Mama, I am also making the Vertical stripe in a bulky weight(5) yarn. Can you please give me an estimate of how many yards of yarn I need to make a 36″ wide x 45″ long blanket? Thank you for creating these lovely baby blankets. Thank you for this pattern. My husbands cousin and his wife are having their first baby in a few months and I have been looking for a baby aphgan to knit for them. This one is perfect for what I was looking for! Thank you so much! Just another way to say to knit them or make them. My knitting is mostly for charity projects. I think the simple lines baby blankets and hats will make a wonderful addition to my patterns for this purpose. They will make some extra special donations. I found you site easy to use. Question: I am making the small vertical stripe baby blanket and it says to cast on 114. Should it be 112 in order for the border to be even all the way around? I just started it but rows 5 and 7 don’t end evenly (I have to knit two more stitches before I finish the border). Is that how it is supposed to be or am I doing something wrong? I recounted and I definitely have 114 on my needle. These rows should work with the 114 stitches. The repeated sections have 12 stitches and in the case of the 114 cast on is repeated 8 times. So the repeated section is 12×8 = 96. Both of these rows have 13 stitches before the repeated section (2+2+9 = 13 and 2+11 = 13) and 5 stitches after the repeated section (1+2+2 = 5 and 3+2 = 5). So for both rows the total stitches are 13+96+5 = 114. I am a beginner knitter. I have begun knitting the simple lines blanket with Red Heart Baby soft yarn on size five needles. After completing four inches I realized that my blanket’s right side is all purl stitches instead of knit. The knit side of the blanket does not look at all like the photo. It is lace looking with diagonal stitches between the vertical stripes. It looked great to me so I just kept going. I think I am following the pattern exactly but I must be doing something wrong. I used a long tail cast on. What am I doing wrong? I really don’t know without seeing it. At least you like it. Thank you for the beautiful patterns that I came upon by looking for something else…what a lucky find indeed. I can’t wait to try these pattern. HOW CAN I COPY JUST THE KNITTING INSTRUCTIONS – IT SHOWS 59 PAGES….I AM KNITTING FOR OUR CHURCH – WE HAVE PRAYER SHAWLS AND LIKE TO KEEP SEVERAL BABY SIZED BLANKETS FOR NEW BABIES. There is a printer icon at the top of the pattern. If you press that, it will create a clean print-ready version of the pattern that doesn’t have the comments. I think the patterns are very lovely. I could not print out the picture of the 2 blankets. I think the background was to light for my printer. Please send more pattersn of the simple nature. Just learning. I think you could make the change but would have changes on every row since they have different boarders. Sorry about that. I made the blankets for the hospital nursery and love the patterns. Do you have hat patterns to match? materials states 5 to 20 oz(260 to 1300yards)of dk weight baby yarn.I’m new to this so how much is that?could you suggest a name brand to use? I added a chart that gives ounces and yards for the different sizes. When you decide on a yarn, the label should give you at least one of these. I like Lion Brand and Bernat yarns. They are available in a lot of chain stores and perform well. They also each offer a variety of baby yarns in different fibers. Hello, I’m using number 4 worsted weight acrylic yarn. I want to make a small baby blanket. Because its worsted do I need to change anything or should I just use the pattern normally. The blanket would look best if worked with the size needles recommended on the yarn. You can adjust the size based on the gage given on the yarn. The cast on for both blankets is a multiple of 12, adding 7 for the squares and 6 for the vertical stripes. If you’d like me to calculate the cast on numbers, let me know the gage of the yarn and what width blanket you’d like to make. Hi Im using caron one pound, it’s a 4 (medium) and according to the label it is 16sts and 20rws for 4×4.I never pay attention to gauge. I make scarves and this is my second baby blanket. I’m pretty new to this. The skein is 812 yards. How big of a blanket can i make? What is the pattern conversion for vertical stripes. Thanks for your help. You should be able to get a 35″ wide blanket out of this with a cast on of 139. Use a size 8 needle with this yarn. Do I knit as is or do I continue with Row 5: k2, p2, k9, to last 5 stitches, k1, p2, k2? Sorry that was confusing. It’s row 5, row 6, row 5, row 6. Thanks for asking this question Paulette. I was a bit confused also..
Mama, these are beautiful! Thank you for sharing!! I love both of these blankets, and I plan on making them both as I have a new grandson and a granddaughter is due in December; My daughters want a “soft fuzzy” blanket so I bought serenity sprinkles.The gage on the package is for a 4×4 use size 11 needles, 11 stitches and 15 rows. Can you tell me if you would stay with this size needles and how many stitches for a small and a medium blanket? Thanks!! Appreciate your advice and wonderful blanket patterns. I would use the size needles recommended on the yarn, because that will usually give you the best looking result. For a 20″ width, cast on 54 stitches for the vertical stripes and 55 for the squares. For a 24″ width, cast on 66 stitches for the vertical stripes and 67 for the squares. I would like to knit the vertical stripe blanket. I see a border in the picture, but doesn’t seem like it’s in the directions. Is it added on after the blanket is done, or could I do a garter stitch border and add on the additional stitches for each row? It is included in the instructions and is just created as you go. Nothing to add once your are done. It’s a seed stitch border and is included, so when you are done, you are done. My examples and therefore charts were based on cotton yarn which is heavier than acrylic. You should be safe just going by yardage. I’m pretty new to knitting and all I’ve ever done so far are dishcloths. How do you fit 100+ stitches on the needle? I don’t even think my longer needles would fit that. Do you have to use one of the circular needles and just use them the same way you would regular needles? I’ve been perfectly happy making dishcloths to give out as gifts, but my first grandbaby is on it’s way and I’d love to give my daughter a baby blanket. Your patterns look simple enough even for me. Thanks! It is possible to scrunch up quite a lot of stitches on straight needles but it does makes it difficult to see the results until you have a few inches of work. I prefer to do bigger items on circulars. Love these two patterns! Can’t wait to start knitting!! I Love these patterns and want to start the vertical stripe one for my first grandchild due in May! Would I just buy circular needle in the size indicated and follow the pattern as is? If you already have straight needles, they will usually accomodate baby blanket sizes. I personally just prefer circular needles myself. Thanks so so much for sharing these patterns. I’m about to make the vertical striped one with sport weight alpaca held double stranded. I HOPE that will work because that’s all I have to knit with. That should work great and sounds like it would be beautiful. I would like to make the squares extra large blanket btw! Cast on 205 and proceed as written. I love these two patterns!! I am expecting a baby boy and want to make him one of each. I was wondering if it would look ok to use the yarn that is multi coloured and changes colours as you go or is it better to use a solid colour? Thank you for sharing these patterns!! On Ravelry I have seen some that were made in the variagated type yarns. They have a different look than a solid color, but they look very nice. So simple but really lovely. Thanks so much for sharing. How nice to have all the sizes. I have made them in DK and Worsted weights and love both. I looked around on the net and wasn’t able to find anything like that. Sorry. These 4 rows appear to be a ribbing. The picture shows a seed stich for border. Am I reading this wrong? Just found this pattern and it is lovely and yes would be nice for hospital donations for their preemies and others as well. Row 1 ends with a knit. When you turn for row 2 it is a purl. Since row 2 begins with a knit, you are putting knits in purls and purls in knits, so, yes, it is seed stitch. I am on the last 4 rows of the square blanket pattern, when I get to the row for casting off, which row pattern do I use? Row 1, 2, etc. it was my first blanket in years and I loverd making it for my new grandson due in May! Cast off using row 4. Finished the blanket and it looks great. Now, do you have any simple patterns for baby booties? I just started making the vertical stripes pattern and I love it. I am making it with a bright yellow. I am making the striped one, but would like to make a seed stitch border at the top and bottom with (K1, P1) 3 times on each end (similar to the square pattern but wider). For the striped one, you cast on an odd number of stitches but for the square with the border you use an even number. If I am doing the striped one, I know I need an odd number of stitches, but can’t figure out how many stitches I need to add to get the wider border of seed stitching. I think I’m correct in assuming I would end at least the first (and other odd rows) of K1, P1 seed stitch border row in K1, but just get more and more confused as I try to figure it out. Could use your help! Cast on 4 more stitches than I call for for the size you want. Repeat rows 1 and 2 as many times as you like for as wide a border as you’d like to have. Repeat rows 5 and 6 until the blanket is the desired length, then repeat rows 1 and 2 for a border. I just wanted to take this opportunity to thank you for sharing your beautiful patterns. I have made both the squares and vertical stripe blankets and hats in several sizes and colors and the recipients absolutely loved them. Again, thanks for the opportunity to expand my pattern base. I knit blankets/hats for all the new babies at our church – 8 so far and three more on the way that I know of. I look forward to trying more of your patterns in the future. Am I the only one whose hem is rolling? I’m 5 or 6 inches in. Do I rip it out and make it a wider edge? I’m thinking making it 10 rows would prevent the rolling. Or, can I block it at the end? Some yarns tend to roll more than others. Blocking will almost always cure it. If a yarn tends to roll, a wider edge will probably not prevent it. I’m starting on the above blanket and when I went to the yarn Store to get some pink baby yarn, they said that DK weight baby yarn is #3 weight. Is this right because it is only 3 ply and your post said 8 ply… Am i misunderstanding something? They said that I couwhat was unopened… Help, please! I haven’t knitted in years and I’m panicing and frustrated! My Grandchild came extra early! Go by the #3 weight rather than the ply. Yes, DK is #3 weight which is called Light weight. The ply can vary depending on how thick or thin the ply is. When knitting something larger than what will fit on a straight needle, you can use a circular needle. Circular needles come in various lengths, 29″ being a popular size for knitting blankets and other larger items. i would love to make the simple lines baby blanket, i would like to use patons beehive dk, tricot double yarn, since i have 10 skeins that i bought many years ago. only problem is i would like to make this into a throw size like 50×55 if possible…could you pls tell me if this yarn would work and if i haver enought, it’s 1-3/4 oz…i would use sie 6 needles. also i dont know how many to c.o…..if you can help in any way, i would appreciated it so much! thanks!! The best way to compare yarns is yards since weights differ so much by fiber. Since that yarn doesn’t give yards, I found a yarn of like weight and fiber content and it was 130 yards for 50 g. That seemed reasonable to me. For a 50 by 55 inch blanket it would take 2460 yards, so 19 of those skeins. The biggest you could make it with 1300 yards is the extra large size I have on the pattern. as a beginner, im struggling with reading and understanding how patterns are written. i would LOVE to make this for a family member that is due in january. my biggest confusion with this pattern is the “squares” and “vertical stripes”. will i be casting on 10 times? how big will the finished product be? thanks in advance for any help you provide. im very excited about knitting and can’t wait to make things for loved ones, just like my grandmother did. There is a chart at the top of the pattern with five sizes. The chart gives the finished dimensions of the five sizes, so use it to decide what size you want to make. Then decide if you want to make the squares version or the vertical stripes version. In the instructions for the blanket you want to make you will find the amount to cast on for the size you want to make. Though simple, these blankets are beautiful and fun to make. I made this for a friend and she is in love, love, love with how stretchy it is! I did the vertical stripes version with a self striping yarn and it gave it a very soft plaid feel. So sweet! Thanks for the great pattern. Perfect TV/car riding knitting! for sharing this pattern with me. I have just starting knitting again after decades of doing other crafts. I Love these blankets. I purchased the yarn to begin, but some of my knitting group members told me that it will take me forever due to the weight of the yarn and needle size. I was disappointed as I have a new nephew due in January. Looking for advice. So many positive comments, but no one has said that they were months in the making. HELP!! It really depends on your knitting speed. If you are generally a fast knitter, these are fast because they don’t have a lot of extra complicated movements like a cable or lace would have. If you think it will take too long, you can double up your yarn, using bigger needles and cast on fewer stitches. Your quick reply was so appreciated. I’d like to make the large and if I double the yarn, how many stitches and what size needles would you recommend? You seem so gifted on the math ;-). Thanks much! Doubling DK yarn becomes roughly equivalent to Bulky weight yarn, so 10-1/2 needles (6.5mm) with a gauge of 15 stitches per inch. A cast on of 103/102 would be 27.2″ wide. A cast on of 115/114 would be 30.4″ wide. I am working on the blanket with squares and I am confused when I get to the rows 7-10. I saw that I should repeat row 5, row 6, row 5 and row 6. Do I need to repeat that again? I tried before and the pattern started to switch. I am not sure if this step could be the cause. Thank you very much! The repeat of this pattern is rows 5-12 which is 8 rows. The wrong side rows (the even rows) are all like row 6, the edging and just purls across to the other edge. For the odd rows, row 5, 7 and 9 are all like row 5. They are the bodies of the squares, so there are 5 knits between the single purl stitches. Then row 11 forms the edge between the squares by having alternating knits and purls across the row. I also have two Great-Grand-Nieces due – one this month and the other in April. I love these blankets and want to know if I fan substitute Caron Natura One Pound Yarn, 100% acryllic. Sorry I do not uncerstand the comment on my querie “awaiting moderation” – please clarify, or just provide me your answer. Also I failed to ask if the finished blankets should be launsered before wrapping an infant. “awaiting moderation” just means that your comments aren’t automatically posted. I have to approve them. I would advise washing the blanket to remove chemicals used in manufacturing and encountered in storage and shipment. You can and I’m sure that would be very nice. My mom, who has since passed, taught me to knit very simple things.So anything I knit, I try to figure out for myself. I have a very hard time following a pattern because the way they say to do it. I do so much better following a pattern! I however find your work to be very easy to follow and I thank you for taking the time for us who are not so good at doing this.After I make this, I was wondering if you have a baby sweater that is simple to make and the instructions are easy to read and follow? Im going to be a great Mimi in May and want to be able to do this!!! Thank you for taking the time to read this and hopefully you will have an easy to follow pattern for me to make my great grandson his first baby blanket.Again I thank you for the easy to follow patterns for the blankets!!! Thank you so much for the great pattern. I haven’t started my blanket yet, but I can tell from reading the comments/questions and your answers that this is going to be a wonderful project! You write patterns very well, respond to questions and are in my opinion. ….a knitting genius! Thank you. Thank you for sharing such a simple baby blanket. Love them! I am having an issue with the x-large square blanket. I cast on 187 and the first 4 rows were fine but row 5 had 3 stitches that didn’t make any sense. These were stitches right before the last 4. Please help! The first 9 stitches are just worked at the beginning of the row and the 6 stitches – p1, k5 – are what is repeated across the row. I can see how it can be taken the other way from how I have written it. I’m going to change the directions to try to make them more clear. I’m sorry they weren’t clear. With a size 6 aluminum straight knitting needle how many stitches do u cast on the knitting needle please reply back to me.I want to make a baby afghan. What size do you want to make? I have written this pattern for size 6, so you can go by my chart for size and the cast on amounts are given in the instructions for each size. Love these patterns. Knitted them for our knit for charity group and had many positive comments. Both of the simple lines baby blankets look beautiful. Could I make them using Plymouth Encore in a drifting color pattern using #7 circular needles? I have 800 yards of the 100 gram yarn to use. What would CO be? If you want a rectangular blanket, cast on 139. If you want a square blanket, cast on 163. I’m a new knitter and am just learning to understand patterns and materials. Do you use straight or circular needles? I am making a cowl neck scarf on the circular needles and somehow got the work twisted so I want to be sure I have options with other needles. You can definitely use straight needles for the smaller sizes. It gets harder to knit the larger sizes on straight needles. These patterns are beautiful! I would like to do a large size as a small throw, using alpaca yarn. Can I just go by the yardage, as far as how much is required, and do I use the same size needles? Thank you for both the patterns, and for your responses to all the questions. Very informative. I suggest using the needle size that the yarn you use recommends. If you let me know what yarn you want to use and what dimensions you would like to make, I can calculate yardage and cast on for you. In this example, when you reach the instruction “repeat from *”, repeat from the first * to the second * across to stitches indicated, in this case, the last 4 stitches. So you will repeat p1, k5 across to the last 4 stitches. Sweet. Got it. Thanks for the swift response! Just finished both hats and love them. Anxious to make the blankets to match. Thanks for these adorable patterns! Quick question— Just getting ready to cast off the squares blanket—- by the way it is gorgeous!!!! Do I cast off doing all K stitches or do I cast off K-P. Cast off while doing the last row, which is K-P. I want to make the striped blanket but want a square equivalent to the large size length. Can you advise how to adjust the pattern? I might be working in the worsted 4 ply since it is readily available. With 4 ply worsted, use size 8 (5mm) needles. Cast on 175 for a 38-1/2″ width. I wanted to tell you how much I admire your generosity of spirit and of your time. You have all the patience of my own dear mother, now gone, and you seem not to mind answering the most involved questions from newbies and experiences knitters alike. Thank you for your lovely patterns and your beautiful and creative spirit. You are a jewel among Mama’s. I so agree. You answer all questions with so much patience.♡♡♡ and the fact you share there these patterns and your time is incredibly generous. This pattern was perfect for what I needed, I cast on 187 and used 5.5 circular needles with DK yarn. I ended up using 4 x 200g balls of nz merino wool & made it to fit a single bed. These make lovely blankets for cats and dogs too – I make them and take them to my local animal sanctuary; the animals become quite attached to them and when they get rehomed they can take them with them to their new home. That shouldn’t be a problem at all. I have just completed the vertical stripes blanket in a sport weight teal merino yarn. It is a simple yet interesting pattern and, because of its classic simple lines, absolutely beautiful. Babies’ tiny fingers and toes have nowhere to be caught in this pattern, so it is preferable to lace patterns. Thank you. I am doing the verticle stripes. Am good through row 5, row 6 has me confused, if I purl across won’t that break the verticle pattern??? Since you will all purls over knits the lines will loose the conformaty? The vertical stripes are formed by alternating knit and purl, not solid columns of purl. Solid columns of purl would disappear like they do in ribbing. The alternating stitches help keep the column from just tucking behind the knit columns. My cousin is pregnant with twin boys and I made both blankets, each a different shade of blue. I am a bit of a novice knitter and knitting them was very easy, a great pattern! Without a doubt, this is my Go-To baby blanket. I very much love these patterns and am anxious to make the striped pattern for my new grandson. I will be using SMC On Your Toes Bamboo which is classified as a super fine wool. the suggested needle size on the wool is 3.25 mm. I would like to make the medium sized blanket and not sure what size needles to use and how wool will be needed. I would like this blanket to be fine knit as it will be used in warm weather. thank you kindly for sharing these patterns and your expertise. Cast on 175 for the squares version or 174 for the vertical stripes version. Use the 3.25 mm needles recommended. With a change in gauge, it’s tricky predicting yarn requirements, but I’d say roughly 1150 yards. Thank you for your reply but I’m afraid I don’t understand. If i cast on 174 stitches for the strped blanket how do I adjust the pattern? Could I just use the instructions for the large blanket? I do apologize for my confusion. Aside from the cast on, the directions for all sizes are exactly the same. Just repeat instructions between * across the row. I don’t give the number of times it should be repeated in the pattern since it can be made any size. Hi,I am I interested in making the vertical stripe blanket in extra large for a cot size. I will be using 8 ply wool & was wondering what size needles I would have to use? Any info would be great please as I want to make this blanket for my first grandchild who is due in September.I love the pattern! 8 ply is the equivalent of DK weight, so 4 mm should work fine. Also would extra large size be the correct size for a cot blanket when using 8ply wool? That sounds like a good cot blanket size. I am getting ready to make the striped blanket. I am beyond the novice stage but still beginner. When reading the directions, what does the* mean? The portion between the * is repeated across the row. So do the stitches before the *, then keep repeating the stitches between the * until you don’t have enough stitches to do a full repeat, then do the stitches after the *. I was hoping someone on Ravelry would have made stripes with the squares version so that I could see what they did, but the only stripes were with the vertical stripes version. I would change colors between rows 11 and 12. That would be the first row after the row with the box tops/bottoms even though it is a wrong side row. The reason I say to change after that row rather than before it is that color changes on rows with purls in the front aren’t as clean as all knit on the front rows. Back again. I would like to knit either blanket using Berroco Comfort Chunky yarn, 10.5 needle, for a 30 x 30 size. I have absolutely driven myself crazy with calculations. How much yarn would I need and how many stitches to cast on? Thank you so much. I can get a tad under or a little over 30″. 103 for squares or 102 for stripes for the tad under measurement and 115 for squares for 114 for stripes for a little over. I can only guess at yardage when making weight changes. I’d guess around 400 yrds. Would it be possible to knit this blanket in 4ply? How much wool would I need? I would appreciate your help with this please. Does the yarn list a gauge and needle size recommendation? Also, what size blanket did you want to make? I would love to make both of these blankets but I need help on the needle size and the CO amount for each. I am using Bernat Pipsqueak Bulky 5 and it states needle 9 for 11sts. Thank you for your help. I want to make the large blanket for each one. Use the size 9 needles recommended and cast on 79 for the Squares and 78 for the Vertical Stripes. Hi, really love the pattern. I was wondering what type of cast on you started with. Relatively new at knitting, and the only cast on that I am proficient with is the long tail method, which doesn’t see practical in this pattern. I actually out of habit almost always use long tail. With practice it is fast and tends to be even and looks nice. The pipsqueak blankets camels out beautiful. Thank you for the help. I would like to make the square one with Red Heart yarn 4 medium, large. The needle size on the package says 8, but that seems a little big. What size needle should I use and how many should I cast on for a large? I think size 8 needles are perfect with Red Heart yarn from my own experience. Cast on 121. I’ve spent hours looking on Pinterest and Ravelry for a simple and elegant baby blanket pattern. When I came across your vertical stripes knitting pattern, I was so happy! My plan is to knit and then line it with fabric. I think it will be beautiful. Thank you so much for sharing. I have a set of size 9 needles (my 8 are currently in use) and have redheart (super saver) yarn to use. Can’t really afford to buy extra right now. If I want to make the large (36″) how many do you think I should cast on? Size 8 IS the recommended size tho. These pattern are so pretty and will be my go to pattern for knit. I am fairly new to knit but can easily read the patterns and have 40+ yrs in crochet. BTW I’ll be doing the simple lines. Made it and came out GREAT!! am making the hat to complement it. For the vertical stripes how do you bind off? Cast off with final row (row 4). This is the first two blanket am knitting for my twins who aren’t yet born but ik they are gonna love it I cant wait to Finish it HappIer Mommy . It will block out. Some yarns curl more with that border than others. Some of the yarns called Baby Sport are actually DK. If they are true sport weight, that isn’t much lighter than DK. You can probably follow the pattern as written, but if you are concerned about it being a bit smaller than my measurements, you can add 12 stitches. I have a good amount of Rowan Cocoon yarn and I’d like to make the vertical stripe blanket with it. Not too sure how to adapt that yarn to the pattern. It’ll be for a newborn as a gift. What size should I make? I know it will have to be handwashed, but I just love working with this yarn. Appreciate any help. With a bulky yarn like that, a crib blanket would be nice. That would be 36″ wide and 50″ or so long. Use the size 10-1/2(6.5mm) needles called for on the yarn and cast on 126. So if I do the Xlarge what size circular needle do I need to use a 36? My rule of thumb on circular needles is that they hold something 2 times as wide and up to 2-1/2 as wide. So you could even use a circular as small as 16″. Yes I was wondering what size would you recommend for a new born. And you said you used dk yarn? What color yarn did you use and what size needle would I need for a new born? The size really depends on the use. Some size recommendations I have seen are 30 by 30 inch or 36 by 36 inch for a receiving blanket, 30 by 40 or 36 by 46 inch for a crib blanket. DK usually uses around size 6 (4mm) needles. The border does reverse on the third row. The border is of 2 stitch by 2 row squares of knit and purl. On the third row they alternate. Help! I have completed about 6 inches (squares pattern) using circular needles. All of a sudden it looks like wrong side is on the front. I took out a few rows and started that part again and it is happening again. What could I be doing wrong? I’m not sure what is happening, but to stay on track, remember that the odd numbered rows are right side rows and the even numbered rows are wrong side rows, so that should help keep you on your row count. Yes I was wondering I only have 24″ circular needle set what is the biggest size I could make with my circular needles. Also what brand of yarn and color of yarn is yours. What is a good size for a newborn med? I think you can comfortably make something twice as wide as the circular needle or maybe a bit more. After that it gets tight and hard to manage. I used Knitting Fever King Tut. The color is 1042. Knitting Fever doesn’t give their colors names but I have seen this color referred to as green and light green. To me it looked like seafoam. If I wanted to do a receiving blanket that is 36″ x36″ would I follow the medium pattern. Also does it matter if its cotton or acrylic. Follow the extra large pattern. Cotton or acrylic depends on it’s use and the parents’ preference. If they want to swaddle the baby in the blanket, then they might prefer cotton. If they want it to put under the baby while doing tummy time, to throw over the car seat to protect from the wind during transit, or more for decoration in the nursery, acrylic might be better. I’d use the 7 because it usually looks the best to use the size called for. With that gauge you will only need to cast on 151 stitches for the extra large size. You will need 6 balls of that yarn. Thank you so much for your help you said cast on 151 is that with both blankets? Good catch. That would be for the squares. The vertical stripes would be 150. I was looking at the squares blanket and had a few questions. Bon rows 7-10 it says repeat rows 5&6 two times. So I will do row 5 row 6 row 5 row 6 is that right? And then on the repeat rw 5-12 it says to end with row 10 what about 11& 12? Yes on rows 7-10: row 5, row 6, row 5, row 6. For the body of the blanket, repeat rows 5 through 12 for the length you want, except on the last repeat you will not do rows 11 and 12. Then you will complete the ending border as instructed. Gorgeous baby blankets! I am new at knitting and have been disheartened by the number of sites that want to charge for a pattern that another site says is for free. Thank you for making these a free pattern! So I cast on the 151like you said but I measured it and it’s 16.50 should it be 36″ since that is what I want a 36″ x 36″ thanks for your help. I was basing 151 on the gauge of your yarn and the needle size. It should be 33″ to 34″. When you cast on it will be bunched up on the needle. You really won’t get an idea until you do enough rows that you can see how long it is unbunched. If you are concerned about the gauge, you can do a 2″ or 4″ swatch and check. If you want the blanket bigger, just add on cast on stitches in sets of 12. I started this project yesterday and I just wanted to ask if anyone knows how long it took them to make this blanket (I’m making the extra large pattern). I spent 9 hours knitting yesterday (I’m a continental knitter) and completed the first 36 rows. It takes me from 12-15 minutes minimum for each row. At that rate, I’ve calculated it will take me 73 (12 min./row) to 91 hours (15 min./row) to complete this project. Does that sounds right? Or am I just torturing myself to run this kind of calculation? I work full time with a 2-3 hour daily commute (no public transportation available) so knitting even an hour on those days is a stretch. I have until September but wanted to complete two blankets. I guess the other one will need to be one that takes less time. I don’t feel like I’m a super slow knitter, does 90 hours sounds like a reasonable amount of time? I’m using sport weight yarn with size 6 needles. Thanks! I hope some others chime in. I’m a slow knitter so blankets take me a long time to knit (I’m a much faster crocheter). I have made several huge knitted afghans over the years, and I just don’t think about how much time they took. Hi Mama, I think I’m a faster crocheter as well but was itching to knit. LOL. I had my husband time my knitting last night and I actually knit 24 stitches per minute, which should mean an 8 minute row and a significant decrease in the hours needed to knit the blanket, but try as I might I cannot do a row in less than 12 minutes! And to top it off, last night I lost track of a row and had to undo (thankfully only) one row. I was just so taken with the pattern here and the yarn I’m using is creating a beautiful pattern. It’s King Cole Splash Peaches. I have decided I will just continue to try and knit as I have time. Thank you for the lovely pattern! I am finishing up the 2nd blanket, one of each. I love these patterns, Not stressful knitting and the end result is beautiful. Thank you so much for sharing the patterns. adapt that size to the vertical stripes pattern? If so how much yarn is required, how many stitches need to be cast on and what size needles do you recommend? Thank you for your help. Use size 8 (5mm) needles and cast on 126. It should take approximately 750 yards. These patterns are just beautiful. Can you please tell me what ply and size needles l would need for this blanket in Australia. I am about to start the King Charles Brocade Blanket but love this one also. 8 ply and 4 mm needles. I have 3 ply pure baby wool. I want knit a baby garment. What must I do to prevent it from getting felted with washes? Thank you in advance. Loved the pattern especially nice with the coordinating hat….but it WONT print for me! Have you tried the print button at the top of the pattern? The pattern’s are beautiful I can’t wait to do them. I’m a complete beginner looking to embark on this project. If I have found yarn online of 310m shall I buy 3 to make a medium sized blanket? and how do I finish with one yarn and start with another mid way through the pattern? Yes, you will need three. There are several different ways to change to a new ball of yarn, and it’s mostly up to personal preference. Here is an article about it. I made a baby blanket using the square pattern. The result made me lookmlike an experienced knitter! A friend even said the blanket looks so dainty. So far tge square is my favorite pattern. Will venture to other pattern soon… Thank you for this great pattern! I just finished the vertical lines blanket. I found using markets at each section was really helpful. I would totally recommend it. Excuse me, if I want to use 5mm needles for a medium sized “squares” blanket, how many stitches should I cast on? Thanks in advance. If you are using DK (#3-Light) yarn, then cast on 127. If you are using heavier yarn, cast on 115. Your baby blanket looks easy for me, as a beginner. My daughter’s baby is due in April and I want to make something. I have done only scarves about 40 years ago, so fingers crossed. Are we using circular needles for these blankets or straight? For smaller blankets you can use either. For the larger blankets it is usually easier with circular. I’m a beginner knitter and would like to knit the “squares” pattern in medium. I will be using US 7/4.50mm circular needles with 4oz dk super wash merino wool. Is the pattern the same if I knit in the round? I was reading that knitting you’re always knitting on the RS when in the round… And I noticed your pattern didn’t have RS or WS. Trying to teach myself how to read the patterns online. LOL. Thanks so much in advance and for your generosity! Yes, generally those knitted in-the-round are knitted on the right side. I don’t always say right side and wrong side on my flat knit patterns, but generally, unless otherwise indicated, the odd rows are on the right side. You can use circular needles and not be knitting in-the-round. In-the-round is created by joining the end of the cast on to the first of the cast on and knitting continuously instead of turning at the end of each row. I do all my knitting on circular needles whether or not it is knit in-the-round. I recently returned to knitting and started with the squares pattern. Perhaps I should have started with the vertical stripes one. I became confused and couldn’t remember where I left off each time. Also, when it said repeat rows 5 and 6 again and when I went to those rows, it would say repeat rows 10 to 12 x2 ( I am just using any numbers to explain my dilema). I hope the stripe one will be better for me. I looked it over and it didn’t seem to have the same type of instructions. The vertical stripes one is easier to keep up with since it doesn’t have a periodic repeating pattern. When I was making the squares this is how I kept up with it after picking it up after having set it down. I would first of all see if I was ready to make an even or odd row. All the even rows are the same, so no problem there. If I needed to make an odd row, I would look at the front to see how many “side rows” (row 5), meaning a row that creates the sides of the squares, since I had made the last “top/bottom row” (row 1) meaning a row that creates the tops and bottoms of the squares. Row 5 creates purl stitches in the sides of the squares separated by knit stitches. There should be three of these purl stitches before making the next “top/bottom” row. I am just returning to knitting after many, many years. I have started making the “squares” blanket for my new grandson born on 3/24. I ran into a small problem where the yarn broke. I tied a knot connecting the broken yarn to a new length of yarn. Apparently I didn’t tie tightly enough for when I came to that stitch, it broke. I now have a hole in my blanket. Do you recommend I pull out my work back to the hole and redo the blanket? I’ve done 16 rows so far, just started two days ago. I’m a fairly slow knitter, I don’t sit all day doing it. Please advise me also on the best way to attach the yarn when I have to start on my second skein. Thank you for your help. Most sites show yarn changes without making knots. It just depends on the yarn. Wools will usually stay woven in and don’t necessarily need knots, but my experience with man-made materials and cotton is that those won’t stay woven in as well, so I make knots. I always leave a tail of several inches that I weave in. On the hole, It depends on how comfortable you are with copying knitting stitches with a yarn needle. What I have done before is to catch stitches above and below on holders so that they don’t ravel further. I take back a few stitches on either side so that I have tails of yarn to tie to a new piece. I tie the new piece to one end and use a yarn needle to work in and out of the stitches above and below in the exact way that the stitches would have been. Then I tie the other end. If you don’t have confidence that you can duplicate the stitches with a yarn needle, then your best bet is to ravel back to where the hole is. Is this for the squares? You should have an odd number of stitches so that each row begins and ends with a knit. When doing the wrong side rows these knits will be purls on the front, so should create a seed stitch border. Cast on 103 for the squares version or 102 for the vertical stripe version. p.s. is this a fairly quick knit? Do you have a newsletter that I can sign up to receive? I really like these baby blanket patterns, and am looking forward to making them…1 of each pattern. I love to knit, been doing it for about 60 years. Two baby showers in the last 3 weeks, and 2 more coming up soon. I hope to have a newsletter in the future but don’t currently. I can be followed on Facebook, Twitter and Ravelry. LOVE, LOVE, LOVE the simplicity of these blankets! Thank you for your inspiration. I’d like to make the SQUARE blanket even wider (about 42-44″ wide before blocking) using Plymouth Encore Bulky(3.5 sts per inch #10 needles). I knit a bit on the tight side and always use #11. Please tell me if I figured about right; Cast on 151 sts, and using 7 Seed st. side borders; (6×22 repeats = 132 + 5 = 137 + 14 border sts = 151??? At times my 73 year old brain just doesn’t compute… lol! I’ll just repeat the pattern until desired length (62″ to 65″ or until I run out of yarn…lol!). Thanks for any help you can offer. I completely agree with all your calculations! Your yarn choice will be lovely. I’m honored you are using my pattern. WOW! Thank you, Mama, I never expected such a quick reply. You truly are dedicated to your fellow crafters, thank you so much. I’m so happy to have my calculations verified. I started in March, and my plan is to make 6 afghans by November 30th, for my 6 grandchildrens’ birthdays. I have completed 3 (2 have already been gifted). I’m right on track to complete my plan, and your help is immeasurable for completing the remaining afghans. I’m so happy I found your website; thank you again, so very much. I think this “simple lines” stripe pattern is lovely. I resized it for Bernat Baby Blanket Big Ball yarn (exactly like knitting with soft, puffy polar fleece) with three big stripes. I set width at 29″ (using an alternating knit/purl cast on for stretch); am knitting with size 11 circular needles; and, nearly at the end of the first Big Ball, have about 24″ length completed. While I’m not the world’s most consistent-tension knitter and this yarn is kinda interesting to work with (looser than usual for me), I’m pretty happy with the results. If you’d like a photo, I’m happy to share. Also, why don’t you have a “contact me” page or address? I intended to offer you a photo when I sat down tonight but couldn’t see how to do so. I’d love to see a photo! I will consider adding a contact address. The problem is that addresses found online are spammed. I can be emailed at mama at thetucker dot com. Thank you very much for sharing these patterns. I would like to make the simple lines blanket squares. I am using sz 8 needles and worsted #4 wt. yarn. Can you tell me how many stitches to cast on for a 24×36 size blanket. If I want to use bulky weight yarn for a baby blanket how much do i need and what size needles? It is Knit Picks Biggo yarn 3-3.75 sts=1″ on #10-11 needles. Can you tell me how i find this pattern for the baby hat please. love the blankets. Please advise if using a circular needle will change the pattern directions? I am confused bc I do magic loop. The pattern is written for back and forth knitting so that the work is turned at the end of each row. It can be made on circular needles as long as the work is turned each row and not continued on the same side. In other words, is the pattern written for straight needles or circular? I am nine years old and I am making this blanket for my little cousin! I am honored! You have touched my heart. I have a son that will be nine in a few months. So far he’s not shown an interest in knitting or crochet. Hello! I am currently making the vertical lines blanket in the medium size and I have completely fallen in love with this pattern! I’m so in love that I am dead set on trying to knit a full-size blanket for myself using a converted version of the pattern, but I’m having a really difficult time. I’m sorry if it’s a big request, but what would I need to make a full-size version? What size yarn? What size needles? What length for the needles? How much yardage? How many stitiches would I need to add to make more repeats per row? This pattern is very versatile and can be made with any weight yarn. Pick out any yarn that you like and would like to work with for a large project. Use the size needles recommended by the yarn. I would use a longer circular needle, maybe something at least a third of the total width you are wanting to make. You can add stitches in multiples of 12. If you decide on a yarn and a size of blanket, I will be glad to calculate the exact number of cast on stitches you need. I can try to make an educated guess on yardage needed. Thank you so much for getting back to me! I spent some time in a local yarn boutique today and decided on a great worsted weight yarn, and I think I want to do a twin-size blanket. The ladies in the shop helped me estimate how many skiens would be needed for a twin blanket, but it would still be awesome if you could help me with how many stitches I’d need! Thank you again so much for your flexibility and your punctuality! Also, is there any way that I could add a little more width to the border? I don’t know if that would completely throw off the counts or anything, so if not that’s totally fine as well! Repeat rows 9 through 12 until blanket is desired length. Then work rows 1 through 8, cast off, finish off, secure and weave in ends. I have just started the square blanket in Wendy Peter Pan baby wool (White sparkle) it is knitting up beautiful. Takes me one hour to knit a set of the pattern with 115 stitches. Will try and upload a picture if I can the next time. Thank you so much for the pattern. I am from Northern Ireland, wonder where everyone else is from. I’d love to see a picture. I don’t currently have a way to upload pictures to the blog comments, but you can share a link or can e-mail a picture to mama at thetucker dot com. I am using #5 bulky worsted weight yarn. For 36″ size how many stitches should I cast on? And what size needle woyld you recommend? I’m assuming a gauge of 14 stitches per 4 inches using US size 10 (6mm) needles. Cast on 127 for the Squares version or 126 for the Vertical Stripes version. easy once you get the rhythm going. I wrote done the rows by number and checked them off as I wents so I would not forget where I left off. Thank you so much for the pattern. Ok, silly question…in the chart above…is the yarn quantity listed for both blankets, or just one? The blankets have the same yarn requirements, so the chart applies to each (a single blanket). I am making the vertical blanket it is beautiful but the sides are turning in is this normal? That does happen sometimes. Some yarns curl more than others. Blocking once it’s completed will fix it. thank you so much but what is blocking? Once the blanket is complete, use enough water on it to get it fairly damp and spread it on towels on a flat even surface. Once it is dry it sort of sets the shape so that it may not have to be reblocked again. Thanks so much for sharing – can’t wait to start one of these for a lady in our village whose baby is due in a few months If I want to knit it in an Aran weight yarn, as long as I use appropriately sized needles and get the right yardage, should it work, or is there some other calculation I need to know to buy the right amount of yarn? The yardage should work pretty closely for the cast on, but the blanket will be larger than my measurements for the cast on amounts. I washed the lines pattern blanket, love the design, but it does still curl at sides. Am now making the squares pattern and I think the sides will be OK. Sure would love to make the line pattern without the curling. I’m going to put this to the readers and see if anyone else has a solution. I made the lines baby blanket and when finished it rolls badly on the sides. Am wondering if I can add some kind of border on the sides bc the finished end does not roll. Any ideas? Sometimes blocking can help with the rolling. If you wanted to add a border, a crochet border would be the easiest to add. Since it’s a very straight edge all around, the possibilities are wide open. Do you CO in pattern? I began just a simple CO and it looked different from the beginning. Thanks! I began with a standard long tail cast on. For your easy knit baby blanket vertical lines, how many stitches would I need to cast on to make the seed stitch border twice as wide as in the pattern? What about for the other easy baby blanket with the little squares? This one does’t have a seed stitch border, but I would need to know how many stitches to cast on to have a wider border. Can I use worsted weight yarn? If so will you give me the CO counts for both blankets for the worsted weight? I think I would want it to be at least 36 inches wide. Thank you so much for helping me with this! Use size 8 (5mm) needles with worsted weight yarn. For 36″ width with the wider borders, here are the modified patterns. Repeat rows 9 through 16 until blanket is desired length ending with a row 14. Then work rows 1 through 8, cast off, finish off, secure and weave in end. Repeat rows 9 through 12 until blanket is desired length. Then work rows 1 through 8, cast off, finish off, secure and weave in end. Trying to make the vertical stripes. Have. Cast on for medium blanket counted before start and row 7 had 6 sts left. Have checked it twice want it to come out right before I begin thanks. Row 7 has 13 stitches prior to the repeat. There should be 125 stitches remaining after those.The repeat is made up of 12 stitches. For the medium size this is repeated 10 times for a total of 120 stitches. After that there should be 5 stitches remaining. I am really a beginner and don’t feel comfortable using circular needles yet. Can I make the large size blanket (162 stitches) on size 6 straight needles, if they are 14″ long? Thanks so much. I was just wondering about the edge: Do you recommend a particular selvedge stitch for the ends? I designed these to not need an additional edging. Maybe some of the readers will post any edgings they have added.